Kapa haka group at WEGC is a student lead group working with tutors to develop their knowledge and skills of kapa haka. They meet at lunchtimes and is open to all students. They also are part of supporting school wide tikanga and teaching waiata and the school haka to all members of the school. 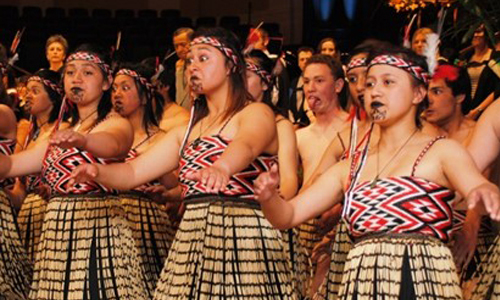 The group is also part of the Ngā Taiohi o te Rāwhiti o te Upoko o te Ika kapa haka group, (the young generation from the eastern boundaries of Wellington) which combines Wellington East with (brother school) Rongotai College. Ngā Taiohi provides opportunities for students to perform and demonstrate leadership in regional, national and international forums. Pōwhiri are led by the combined group to welcome and honour guests into the school. The centre represents the unification of nga taiohi (youth), their identity and joining whakawhanaungatanga with others. Black symbolises the creation of the universe. White symbolises ‘Te Ao Marama’ representing the importance of education and striving to reach one’s highest potential. Red symbolises te toto whakapapa or genealogical lines.